When calling upon a dormant skill or action we often use the phrase, “it’s like riding a bike.” That’s because once you learn how to ride a bike, it’s a difficult thing to forget. What is easy to forget though: Actually buying a bike. That is where I found myself recently when prepping for a date with my daughter Nola (9). A lake sits a few city blocks from our house. I pitched the idea of riding around it then getting some ice cream afterward (Because we’d need to replace those calories somehow. Am-I-right?). Nola leaped with enthusiasm at both activities and we skipped to the garage. What? Don’t look at me like that. I remember how to skip. Our joyous skipping came to halt when we opened the garage door and remembered that we didn’t have any bikes of our own. Well, Nola did. But she’s since outgrown it and didn’t like the idea of her knees slamming into her eye sockets. It’s hard to enjoy lake scenery when you look like Rocky toward the tail end of his fight with Apollo. Fortunately, her cousin that lives with us had a larger bike she could use, albeit a “boy” bike. I, on the other hand, saw only one bike in our garage big enough for me. I promptly turned and began to scour every nook an cranny for any other option. I looked behind boxes. I looked in cabinets and drawers for anything else to ride. I then took a deep breath, told myself that I’m secure in my manhood, and tossed both bikes in the back of our minivan. A Thursday afternoon wouldn’t have many people at the lake, right? At least not the judgmental kind. We pulled up to the parking lot and a few cars peppered the stalls. Not bad. Probably just fitness people that will be so focused on a setting a new PR, that they won’t notice a grown man apparently on the way to fill his bike-basket with freshly picked daisies from the meadow. I yanked both bikes out of the van and dropped the kickstands. Nola and I stepped back, crossed our arms, and surveyed our two-wheeled stallions. And by “stallions” I mean: One adolescent male horse and his quirky mom. I’m secure in my manhood. We mounted our steeds and hit the path that traces around the lake. The late afternoon held back much of the mugginess, and the wind in our faces made for a nice ride. Within the first thirty feet, we encountered a walker—not The Walking Dead kind—and a couple guys fishing on the bank. The fishermen just stared at us on our mismatched bikes, trying to inconspicuously make sense of it. The walker just stole a quick glance, reminded himself of the times that we live in, and went back to concentrating on his audiobook while trying to pump his arms in the most exercise-y way possible. Walkers want you to know they are working out too. As we swung around the lake, I soon found myself leaning over and resting my forearms on the handlebars. Handlebars that probably should have had glittery streamers attached, but fortunately did not. I hunched over the “girly” bike, hoping to appear like I’d lost a bet. Felt better than appearing like I didn’t own a bike and borrowed my wife’s. One lady we passed wore a backpack and held a walking stick. She grinned large and told me, “I like your bike!” Though it may have been sarcasm. It’s hard to trust a lake-hiker that also has a cigarette hanging out of their mouth. Halfway through Nola complained that her leg muscles were burning but didn’t want to stop, we were having too much fun. So we then committed to riding around the whole lake. Do or die. The funny thing about this particular lake—the funny thing that we learned after traveling 3/4 of the way around it—is that the path does not make a complete circle. A busy main street caps one end of the lake, and we assumed a sidewalk or something similar would as well. Though when we got there the only thing that paralleled the street was a sad, unpaved shoulder and a guardrail. The bike path we were on actually jumped across the street and shot off to God-knows-where—like Michael Scott planning a fun run that’s 5km from the office, instead of leading back to the office. We had two options. Save time and take our bikes across the muddy, craggy shoulder of mockery—at rush hour. Or haul our tired bodies back the way we came, doubling our distance, and making us late for dinner. We thought about this for a while. 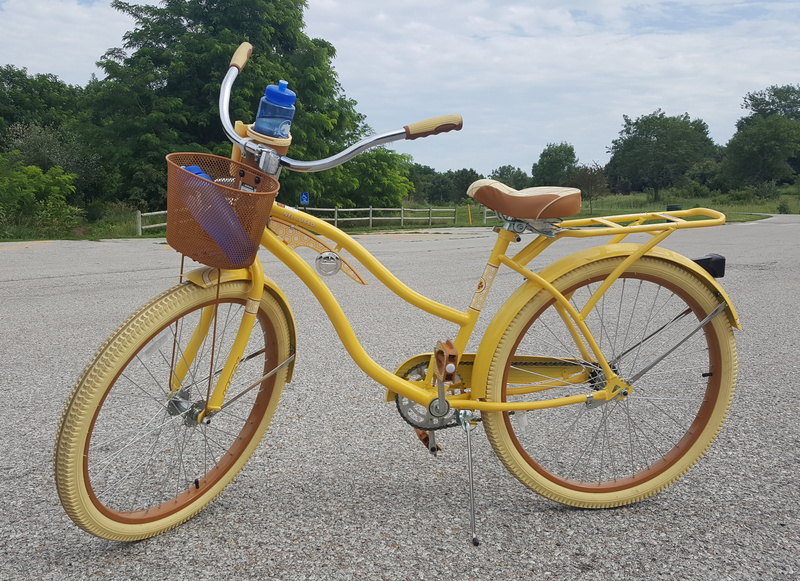 My wife’s yellow cruiser looked deep into my eyes and begged me to find a grassy hill, spread out a blanket, and see what all the Anne of Green Gables hype is about. Seemed a little risky but the shortcut was worth it. It’s a good thing half of Omaha happened to be heading home at that hour, or the awkwardness would have been far too bearable. A few times we had to carry our bikes over deep fissures in the shoulder. A few times we had to wait for a break in the stream of cars because the shrubbery pushed us too close to the street line. A few times we hit muddy patches, coating our tires in caked gravel. A few times Nola yelled out that her mom is going to kill me when she finds out that I took her precious first-born galavanting through heavy traffic. But every time, when a car passed, I knew for sure that the driver saw what I was riding and took a second to ponder gender. Glad I could provide some reflection for all those on their commute home. Finally, the shoulder opened up and we found the path that would lead us to our parking lot. Fortunately, it began with a luxurious, lengthy, downhill ride. Unfortunately, centrifugal force shot the mud and gravel on our tires free. I was behind Nola and received a lot of it. I now know what a firing squad is like. Riding in the grass did little to clean the tires. When we arrived at the van I had to figure out how to load up the bikes without getting mud everywhere. Our van is so immaculate that you could perform surgery in the back seat. We keep the seats and floors in such a clean and pristine condition that—aaaaahahahaha, sorry, I thought I could keep a straight face during that. The truth is, a family of raccoons could be living under our seats and we probably wouldn’t even notice (That works because raccoons are attracted to trash, right?). Regardless of our van’s condition, I felt I should at least try to avoid streaks of mud. With all the crap our kid’s leave on the floor, we found a towel and some clothes upon which to rest four soiled tires. I then pointed the van at Wendy’s and floored it. Nola and I had survived heavy traffic and ridicule and we wanted a flippin’ Frosty to let us know it was worth it. 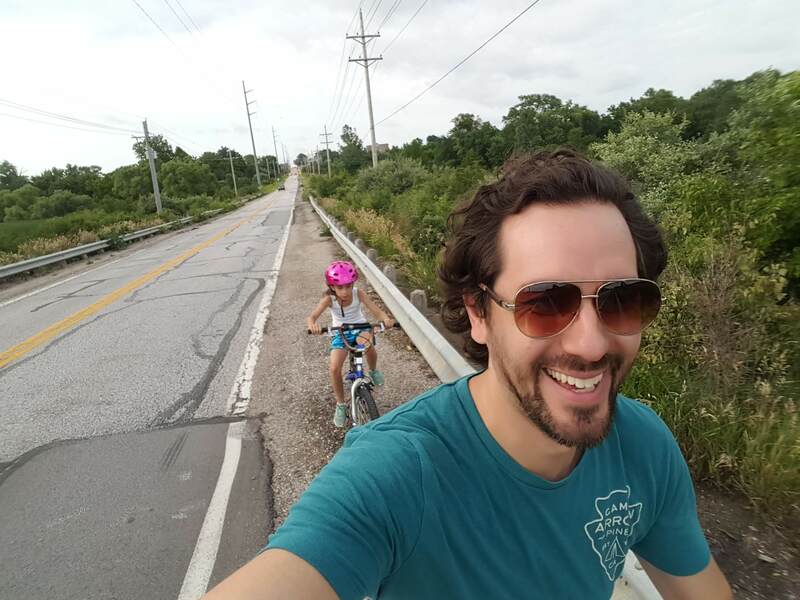 Seared into my mind is the day I taught my daughter how to ride a bike. Running behind her, keeping her steady. Times like that stick with you. 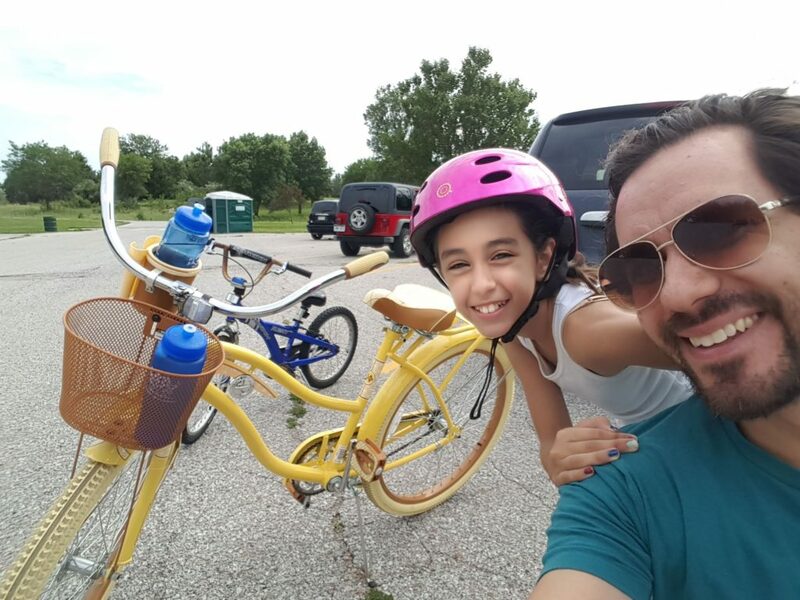 Now she’s riding around the lake with me and…uh…tackling unpaved shoulders in rush-hour-traffic. It showed her age. And I both loved and hated that. For me, and hopefully for Nola, riding those mismatched bikes is another memory that gets tattooed in our history. We all want those times in our lives, the ones that stand out from the grind and make us smile big. Sometimes I mistakingly assume we need to do extravagant things to be memorable. Like, take the whole family to Disney World for example (with four kids I doubt this is in our stars anytime soon). Of course doing grand things like that make memories. But while we’re saving up money for those things there are plenty of memories to be made that don’t require much money at all. The beauty is, that all this memory cost was time, some exercise, and a couple bucks for dessert. Thanks Dad. I have many with you too. This is crazy awesome. Way to take it like a man and share the laughter along the way, Ryan. Well told! It was like I was living it.